Welcome to Fish Window Cleaning- your local window cleaning company for Lee's Summit, Blue Springs, Independence, Raymore, Belton, Grain Valley, Oak Grove, and Greenwood. Shiny windows are your goal. We provide cleaning of all types of windows, even the hard to reach ones of your home. 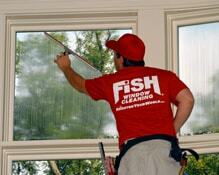 You can rely on Fish Window Cleaning to take the utmost care of your residence as we clean your windows. We wear fresh shoe covers as we enter your home and use cloth pads under each window as we clean it to protect your carpet and wood floors. We work quietly and quickly as we move from room to room to cause the least disruption. We even introduce our team to you before we start cleaning so you know exactly who will be giving your windows a spectacular shine.